fix for a client side code getting called on server. Oops! Item dump nbt now will use correct CraftTweaker support if craftTweaker is installed. "/mp inContainer (nbt, ore, setpretty, extendedclasses, classes)"
Better control over what data you want to read. class & extendedClass: will give the Class names and all super classes to that one. Removed the parser for now. As it didn't work as intended. but will return in a different form. Looking at command now also gives more data including: Mod ID's, Class, Extended Classes, String ID, Int ID. Updated the Quick menu some. now pressing the keybind for quick menu more than once toggles between the two menus. There is a local Quick Commands and Global Quick commands. Local is for that local instance of minecraft. Global is for any instance. Made the scrolling windows able to be clicked and dragged to scroll. Made sure URL text files get encoded correctly. Used in MPBasic Tools to get change logs from a url. Mputils fixed mpinfo editor not saving correct data in spots. Added some new tools for addons to use. Mainly creating Gist and sending http post data. New Command: "/mputils inventory" Grabs the entire inventory and dumps it into your clipboard. Works like (hand & hotbar) commands. New MPInfo.info file with configurable settings in "mputils.cfg"
Added new Command argument to getting item data. "/mputils (hand, hotbar, inventory) ||"
copies to clipboard as "The cow jumped over the minecraft:item"
Changed Quick Commands Keybind over to decimal on the numpad. Updated Quick Commands to make adding and removing commands easier. Added new Command "/mputils RecipesDuplicates"
Recipes are dumped into a file in root dir. 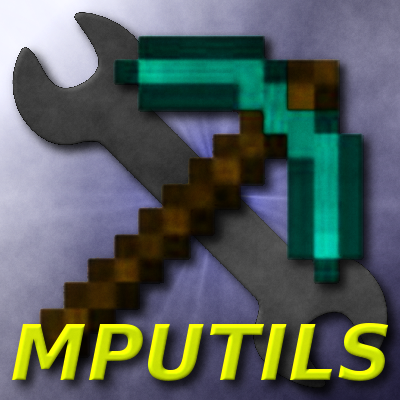 "/mputils hand" && "/mputils hotbar"
New Options are "ore", "nbt, & "<>"